Arm your workstation for productivity and comfort. Comfortable viewing from every angle. Designed to fit your unique needs, our display mounts are built with comfort, quality, cost and versatility in mind. Built and tested to withstand the demands of a busy work day. Tailored to fit all your needs, our enhanced designs are loved by business professionals around the world. VESA compatibility is a must for monitor and TV mounts. Our comprehensive portfolio covers all VESA design variations, making it easy to find a mount for any application. Buy from a leader in IT hardware and support, trusted by IT professionals around the world. Improve comfort, increase productivity and save desk space by customizing your monitors to fit your workstation and viewing needs. Work more comfortably - Our monitor mounts allow you to personalize your displays to suit your specific needs. Whether working in a compact area or with a full workstation, monitor mounts can help optimize space and customize the positioning of displays. They feature easy-to-adjust height and tilt mechanisms, so you can choose your most comfortable viewing positions without disrupting your work. Boost your productivity, with multi-monitor efficiency - Adding additional monitors to a single computer gives you the additional screen space you need to simplify multitasking and maximize your productivity. Using two displays makes it easier to reference material on one display while working on another, saving you the time and hassle of having to flip back and forth between documents. Multiple screens mean more productivity. Make the most out of your workspace and worktime with StarTech.com display mounting solutions. Easily add a tablet to your workstation or customer-facing kiosk with wall, desk and floor mounts and stands, and ensure it’s secure when you’re away. Full Motion Adjustment - With adjustable tablet stands, you can type and swipe without having to hold your tablet in your hand or setting it down on your desk. A tablet holder allows you to easily change or adjust the viewing angle and orientation (portrait or landscape) of your tablet all while it is still mounted in the stand. Tablets offer lightweight and compact computing solutions for the office and boardroom. For desktop use, tablet stands can easily be integrated into a workstation to provide maximum comfort and convenience. Choosing a tablet stand with height and tilt adjustments will allow users to create their optimal viewing experience. 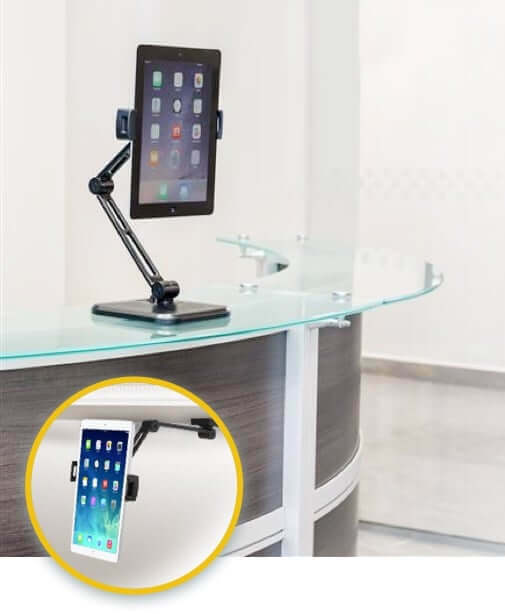 In a boardroom, a secure and durable tablet stand will help prevent theft and damage to a tablet being handled by various people throughout the day. A tablet mount for a storefront kiosk, where the tablet may not always be under the care and protection of a trusted user, should be able to provide not only a durable solution, but also a secure one. Durability is key when the tablet is being handled by multiple users, while a lockable and secure solution can help prevent theft. * Reminder: Not all tablets are the same! Size and control placements differ between various brands and tablet generations. Make sure that the mount you choose is compatible with the tablet you prefer to use. Bring your visual media alive with wall and ceiling TV mounts that allow you to confidently hang, tilt, swivel and secure your 32-100-inch TVs. 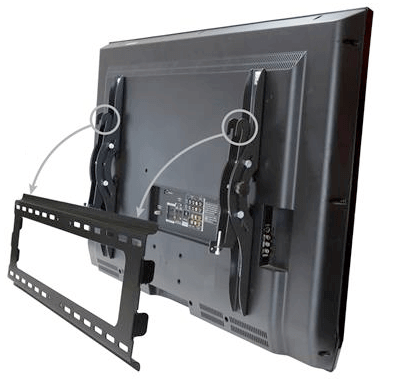 Fixed Mount: Fixed TV mounts are perfect for users looking for a low-profile mount option. Fixed mounts often sit close to the wall and offer a sleek and simple mounting solution. Fixed mounts are best suited for environments where lighting can be easily controlled and adjusted to avoid screen glare. Tilting Mount: Tilting mounts provide users with a wider range of viewing options, allowing individuals to tilt the position of the TV for a comfortable viewing angle and minimal glare. 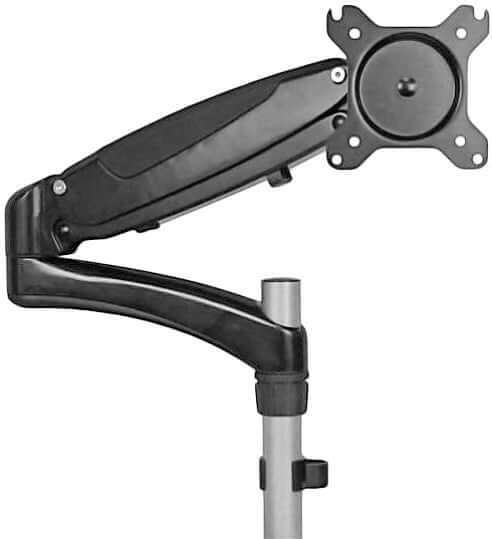 Full-Motion Articulating Mount: Full-motion articulating mounts offer users optimal viewing angles and positions. They allow users to easily tilt the TV up or down, move the TV away or closer to the wall, as well as swivel the TV from side to side, depending on where viewers are sitting. 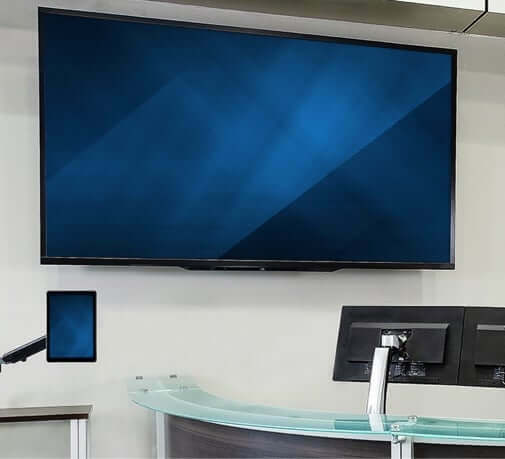 Full-motion articulating mounts also sit further away from the wall than most mounts, offering more room behind the mount for cable management and a digital signage player. Ceiling Mount: For areas with limited wall and floor space, ceiling TV mounts offer a sleek, space saving solution. Many will be height adjustable to allow users to display the TV from their preferred height/distance from the ceiling. They also feature many of the same motions available for TV mounts, including options for a fixed, tilting and swiveling solution. 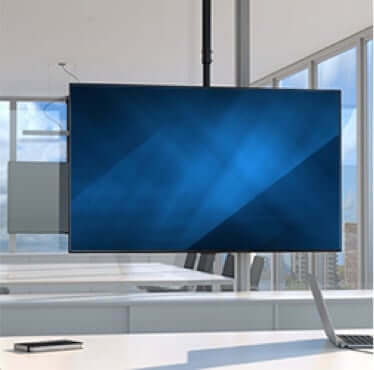 Tilting can help users adjust for lighting, while the ability to swivel the TV can help accommodate various viewing angles, and, depending on the capabilities of the mount, even allow users to rotate the display 180 degrees to accommodate virtually any viewing position. Ceiling mounts and poles also have the ability to be adjusted and secured at various angles, allowing for installation on sloped and level ceilings. Security: There are several TV mounting solutions equipped with anti-theft features to ensure mounted TV stay safe and secure while on display. Protect your investment in areas with high traffic and minimal supervision with TV mounts that feature heavy-duty steel bars that can be locked into place. Discover the right mounting solution for you with the help of these resources. One of the Best Monitor Mounts I've Used! This is a terrific, heavy duty, well-built mount that offers a huge range of motion and precise adjustments for your monitor setup. This is perfect. Very sturdy … Moves easily. Frees up my desk space. Rotates. I would definitely recommend. When using my thunderbolt monitor my neck would get sore from tipping my head up to see the entire screen. I needed to lower the monitor so this would lessen... I installed [this stand] in less than 30 mins. Directions were excellent. Nice unit I would recommend this for the qualifying iMac as well. The design of this stand is the best on the market - it is lightweight, can be wall/desk mounted, and can be tilted to any angle. Also, it is easy to remove the tablet from the spring-loader "gripper"
Works great for both iPads and Android tablets. It's well made and not too heavy. Great product! Awesome stand - it securely clamps on the table using a locking nut that can only be unscrewed using a spanner wrench. We've tested several methods of mounting iPads for use as cash registers, and this is by far the best and most flexible. The mount itself is amazing. Made from sturdy materials (the locking bar is genius) and all the hardware is included for every kind of TV, spacers and different kinds of fasteners. Installation was easy and left me confident in the security of the installation. Something anyone who has hung an expensive TV wants. You can feel the quality of this mount! I replaced our projector in our conference room with a 50" tv and this wall mount. I love the range of motion this mount has which allows a presenter to move or point the TV in many different ways. The mount was very sturdy and I had no worries when shifting and turning the mount. Incredibly stable, and easy to install. The ability to "pop" the screen away from the wall for rear access makes ALL the difference. StarTech.com makes it easy for IT professionals around the globe to find, get and use the hard-to-find connectivity parts they need to enable their solutions. From the latest technology to legacy products — and all the parts that bridge old and new — we can help you find the parts you need.